Overloaded with too many active windows from too many apps? Want to quickly flip through them, minimize one, maybe maximize another? Maybe you’d just like to really focus and go full screen? We’ve got this all covered with some simple keyboard shortcuts that can improve workflow by speeding up window management and how you interact with app windows in MacOS and Mac OS X. This is not about Mission Control, this is about direct window management of any windows for any apps, so check out the keystrokes and let us know if we’re missing anything. Much like you can Command+Tab your way through active applications, you can Command+Tilde your way through active windows in the current application. Considered a “must know trick“, the next time you’re buried in a bunch of windows use this keystroke, it is so much faster than pulling down the Window menu and hunting around. Just flip through them all like a deck of cards and stop on the window you want. To be clear, we’re talking about the `/~ key, which is alongside the 1 key on a standard US qwerty keyboard. Done with the current window for now but don’t want to close it out? Quickly minimize it instead with Command+M, it’ll be sent down into the Dock where you can retrieve it later. Now you can hit Control+Command+= (or whatever else) to instantly zoom and maximize the current window, nice! 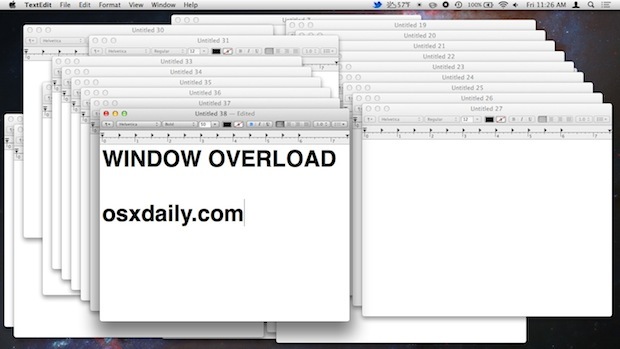 In a mess of window clutter from a million applications? Just hit Command+Option+H and you will hide all other applications and their windows instantly, leaving you with only the current application and it’s windows visible. Much less clutter, much less to distract. This keystroke is best paired with a defaults command that makes hidden app icons transparent in the Dock, giving you a simple visual indicator of what’s hidden and what’s not. When you really need to focus or make the most of limited screen real estate on a laptop, go Full Screen. Done with full screen? Hit Command+Power again to toggle out of it. If this one isn’t working for you, you may need to set the Full Screen toggle shortcut manually beforehand. You are aware that Command+W closes the current window, right? If not, well you’ll be thrilled to find out it does. Command+W has been around since the earliest days of Mac OS, and it gets so much use by longtime Mac users that it’s easy to assume that everyone knows about it. Nonetheless we often encounter people who have never heard of it, so learn Command+W and thank yourself later. Similar to the above command, but by adding the Option key you can close ALL windows of a given application or in the Finder by hitting Command+Option+W where ever you are. Thanks to @DrFrot for the reminder of this one. Mission Control can be salvation to window clutter by allowing you to set unique for apps, app groups, and then easily view every single window that’s open too. There’s much more to it, but it’s a bit beyond the scope of this article, so you can read 9 tricks on getting the most out of Mission Control if you’re interested. You can use command+tab to toggle between applications. as a windows refugee, I think Apple has overcomplicated this. One thing that gives me fits is if I minimize a window, and send it to the dock, how do I get that window back to active? Or if I have multiple Safari, Preview or other windows open, there’s no simple way to ‘browse’ through them via the keyboard. Command / Tab cycles you through the application windows, not all instances of an application like an email you’re reading, another you’re composing, etc. I can recommend Witch (http://manytricks.com/witch/), it ‘fixes’ all your problems. Dave, per Tip 1 above, one can easily cycle through multiple open windows of any application via Command – tilde. No, that doesn’t work (like windoze) for any window that you have minimized to the dock, only for windows open and active on the desktop. As an example, let’s say I am reviewing several pdfs, and browsing the ‘net. I reach my objective on 2 of the pdfs & minimize them. They are stuck on the dock until clicked on. In windoze you can simply alt-tab through the list of all apps, open or minimized. What’s the wallpaper used in the first screenshot? It’s not the default Galaxy (OS X Lion), is it? Thank you for tip #3. I really don’t like Fullscreen except for writing or movies, but really missed the old Minimize/Maximize of the green dot. Now it’s back. Woohoo! Neither ‘Zoom’ nor ‘Maximize’ worked for me after the update ( to macOS Sierra v. 10.12.5 ). What worked for me was to install ‘Spectatle’ ( https://www.spectacleapp.com/ ). And set that up. Another way to permanently fix it, is to use Witch ( https://manytricks.com/witch/ ). I’m not an employee or owner or anything – just a user. I may I say, that it works wonderfully for my needs.